We Have the Perfect Reclosable Bags for You! We are the Reclosable Bag Experts! International Plastics is a direct importer and wholesale supplier of reclosable poly bags. We offer both imported and domestic made Plastic Resealable Bags with many applications in mind. We stock over 100 million reclosable bags in over 420 sizes and styles... And if you don’t see what you need, we can custom make a reclosable bag to your exact specifications. Wholesale supplier of Minigrip Reclosable bags with Red Line. These premium quality reclosable poly bags are manufactured to offer a balance of superb strength, quality and functionality. If you have a retail application that requires the superior clarity for product presentation then consider Premium Minigrip Reclosable Poly Bags. Reclosable bags are leak resistant to some, but not all materials. We are the Reclosable Bag Experts! International Plastics is a direct importer and wholesale supplier of reclosable poly bags. We offer both imported and domestic made Plastic Resealable Bags with many applications in mind. 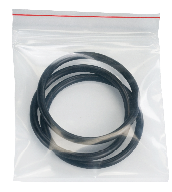 We stock over 25 million reclosable bags in over 250 sizes and styles. We also offer Custom printed recloseable bags in nearly any conceivable size. Reclosable bags are leak resistant to some, but not all materials. There are many uses and applications that Minigrip Red Line Bags can handle including; packaging small parts, holding appliance instructions, collector items, saving software, holding legal documents, protecting photographs, and much more. These bags are excellent at keeping out contaminants such as dirt, dust and moisture! Packaging Woes? Get a Grip. Get Minigrip. A plastic Gusset Bag has sides or a bottom that allow you to package thicker or bulkier, larger items by having extra poly or plastic on the sides or bottom that expand. Our flagship resealable bag has withstood the test of time. Since introducing the first reclosable bag in the US over 50 years ago, our Premium Red Line bag has become and still remains the standard. With so many size and film thickness options, it's easy to see why our exclusive Color Line resealable bag — with its "easy open/close" zipper — is so popular and widely used. It fits any industrial need. Remember, the Minigrip bags Red Line on the lip of the bag is our guarantee of consistent quality... each and every time. - The Color Line stands for the highest quality reclosable packaging in the world — bag after bag after bag! - Premium zipper "snaps" open quickly and easily — even with one hand. - Reinforced side seals to ensure bag doesn't split when opened or filled. - Superior clarity — you can see the difference. - Manufactured with 100% FDA-approved virgin resins — and they're NAFTA certified. - Made of low-density polyethylene (LDPE) and are 100% recyclable. - "Superior" rated manufacturing environment by the American Sanitation Institute. Crystal clear polyethylene (PE) film.